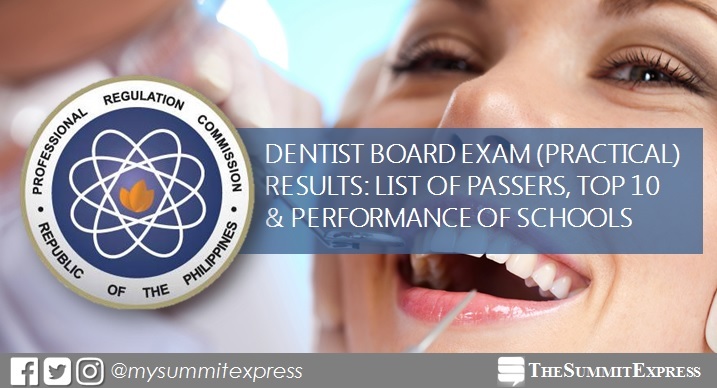 MANILA, Philippines - The Professional Regulation Commission (PRC) officially announced on Wednesday, January 10, that 762 out of 1,484 (51.35%) passed the December 2017 Dentist Licensure Examination (Written Phase) and 763 out of 769 (99.22%) passed the Dentist Licensure Examination (Practical Phase) given by the Board of Dentistry in Manila this January 2018. Pauline Tiffany Ong Uy from University of the East (UE) - Manila topped the board with 84.70%. It was followed by Alyssa Jachelle Cancico Zacarias, Virgen Milagrosa University Foundation (VMUF) alum with 83.90%.